As at most groundbreakings, a bevy of officials turned over ceremonial shovels full of dirt. But at the September groundbreaking for Flight Works Alabama, eyes turned to the heavens as well as the ground. Mobile school kids had a chance to don virtual reality headsets and check out the displays that will welcome visitors to Airbus facilities at Mobile Aeroplex. Dubbed an aviation experience center, Flight Works will offer interactive exhibits to lure young people and adults to aviation careers. 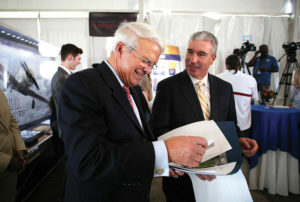 Nine educational partners — Auburn University, Bishop State Community College, Coastal Alabama Community College, Embry-Riddle Aeronautical University, Troy University, Tuskegee University, University of South Alabama, University of Alabama and University of West Alabama — will provide courses for new and experienced aviation workers. Flight Works sponsors to date are Airbus Foundation, Alabama Power Foundation, Conde Systems, Mobile County Commission, Mott MacDonald, Hoar Program Management, Johnson Controls, Mech-Net, Pratt & Whitney, Safran and Snap-On.